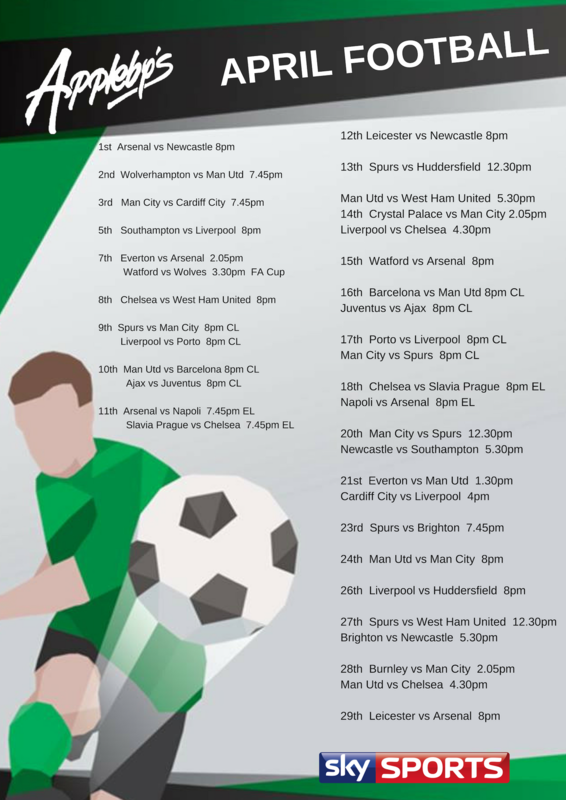 Catch up with all of your favourite sports here at Appleby’s Torquay. We offer coverage of live sports including Football, Rugby, Tennis, Boxing, Cricket, Golf, Formula One and much much more. All our sport is shown in Fabulous HD on our 2 giant screens, 2 plasmas and an all weather 55’ outdoor tv viewed from our terrace with seating for over 200 people. Order fantastic food and relax while watching the sports you love in a great friendly atmosphere. Please see below for the latest sporting events live here at Appleby's.